This surgical technique illustrates the injection of gene therapy vectors and stem cells into the subretinal space of the mouse eye. Wert, K. J., Skeie, J. M., Davis, R. J., Tsang, S. H., Mahajan, V. B. Subretinal Injection of Gene Therapy Vectors and Stem Cells in the Perinatal Mouse Eye. J. Vis. Exp. (69), e4286, doi:10.3791/4286 (2012). The loss of sight affects approximately 3.4 million people in the United States and is expected to increase in the upcoming years.1 Recently, gene therapy and stem cell transplantations have become key therapeutic tools for treating blindness resulting from retinal degenerative diseases. Several forms of autologous transplantation for age-related macular degeneration (AMD), such as iris pigment epithelial cell transplantation, have generated encouraging results, and human clinical trials have begun for other forms of gene and stem cell therapies.2 These include RPE65 gene replacement therapy in patients with Leber's congenital amaurosis and an RPE cell transplantation using human embryonic stem (ES) cells in Stargardt's disease.3-4 Now that there are gene therapy vectors and stem cells available for treating patients with retinal diseases, it is important to verify these potential therapies in animal models before applying them in human studies. The mouse has become an important scientific model for testing the therapeutic efficacy of gene therapy vectors and stem cell transplantation in the eye.5-8 In this video article, we present a technique to inject gene therapy vectors or stem cells into the subretinal space of the mouse eye while minimizing damage to the surrounding tissue. Purchase or make a 100 μm diameter needle from a glass capillary tube. This can be done manually by using a Sutter P-97 pipet puller or other similar equipment. The end of the capillary tube will be heated and pulled until it reaches the desired diameter (100 μm). A smaller diameter needle can be used for gene therapy vectors; however, this is the recommended diameter for cell injection without damage to the cells or the eye. Compared to steel needles, the glass capillary needle has a very fine, but blunt tip, to allow for visualization of the injection fluid and access to the subretinal space without causing retinal breakage. Clean these pulled needles if needed using 70% ethanol, and store in a sterile container. A 15 cm sterile tissue culture dish with tape to hold the needles in place is one way in which to keep the injection needles covered and in a sterile environment. At this point, complete the set-up within the surgical room where the procedure will take place. It is easiest to keep all equipment in the surgical room at all times in order for it to remain sterile, especially if this procedure is done within a barrier facility. Aspirate silicone into the injection needle and eject the silicone to leave a coating along the inner walls of the needle. The silicone coating maximizes the passage of cells and viruses through the needle bore, which would otherwise stick to the inner glass capillary walls. Obtain an approximately 8 cm length of sterile plastic tubing by cutting a 25 ¾-gauge blood collection set with luer-lock at the point directly after the needle (removing the needle from the tubing). Fill a 1 ml Sub-Q 26 5/8-gauge slip-tip syringe with sterile saline and remove the needle from the syringe. Attach the injection needle to the cut end of the plastic tubing and attach the syringe to the luer-lock at the other end. Aspirate sterile saline to fill the dead space in the tubing and capillary needle, ejecting some saline through the needle to ensure that it is correctly attached without any leakage. Next, aspirate a small, approximately 1 μl amount of air, into the tip of the injection needle. This will separate the saline from the injection fluid and provide a visual cue indicating the end of the injection fluid during the surgical procedure. The injection apparatus should be kept on a clean surface wiped down with 70% ethanol during the surgical procedure. Additionally, all equipment used during the surgical procedure should be cleaned both before and after with 70% ethanol, for the exception of the injection needles which should already be kept sterile and ready for use. These needles should be disposed of after surgery, and not re-used. Finally, aspirate injection solution containing the desired packaged gene therapy viral vector or stem cells. This can be done by taking up the injection solution into a sterile pipet tip, then pipetting the solution onto the surface of a sterile cell culture dish. The solution can now be easily aspirated into the injection needle using the syringe. The amount needed will vary depending on the age of the mouse. For our purposes we use post-natal day 5 mice, which can be injected with 0.5-0.8 μl of injection fluid. Smaller amounts, 0.5 μl or less, can be used for younger mice and larger amounts, such as 1 μl, can be used for adult mice. The viral titer or number of cells needs to be determined based on the virus/cells being injected and their desired target tissue, as too many viral particles or cells in a small volume can lead to toxicity for the retinal cells. In the video, for visualization purposes, we have used 1.5 μl, a greater amount of dye than necessary to inject into the eye. Within the sterile surgical room, stabilize or anesthetize the mouse according to the locally approved animal handling protocol, which will vary by age of the mouse. Common anesthesia for adult mice includes the use of isoflurane gas or an intra-peritoneal injection of 0.1 ml/10g body weight of ketamine (100 mg/ml) and xylazine (20 mg/ml) in sterile saline. For perinatal mice, common anesthesia techniques include the use of isoflurane gas or cryoanesthesia (hypothermia). All anesthesia techniques must be approved by your local IACUC committee before use. We typically use post-natal day (P) 5 mice, although similar techniques can be applied to mice as young as P0 or to adult mice. The surgical procedure cannot begin until the mouse has ceased moving the limbs and no longer responds to toe pinches. For perinatal mice, they will become noticeably lighter in color since the blood flow will slow down, another key to knowing that they are fully under anesthesia. In perinatal mice, use Vannas straight scissors to make an approximate 1.5 mm incision along the closed lid fissure. Be careful to cut at the indentation, where the eye will naturally open in the future. This ensures that the lids will heal and open properly during the development of the mouse. A surgical blade can be used for this purpose, although we prefer Vannas scissors since they reduce the risk of puncturing the eye during this procedure. In the video, the scissors were used to directly puncture and cut along the eyelid margin. When learning this technique, forceps should be used to lift the eyelid before cutting and reduce the risk of damaging the eye. Pull apart the eyelids with curved dressing forceps to proptose the eye and pinch the eyelids slightly underneath the eye to hold it proptosed for injection. If the lid incision made in step two is too large, the eye will slip back under the lids and prevent adequate exposure during the injection procedure. For adult mice, applying slight pressure around the eye with dressing forceps can hold the eye proptosed for injection. Make a small scleral incision at or posterior to the globe's equator by scratching the surface with a 15-degree microsurgery blade. This incision should be only large enough to pass the tip of the injection needle, but no larger than that. If preferred, a small, sharp needle such as an acupuncture needle can be used to make this incision into the subretinal space instead of the microsurgery blade. In darkly pigmented animals, a dark brown-pigmented tissue (the choroid-retinal pigment epithelium) will become visible at the point of incision. In lighter pigmented or albino mice, a surgical marking pen can be applied to the tip of the microsurgery blade to leave an ink spot indicating the incision site. 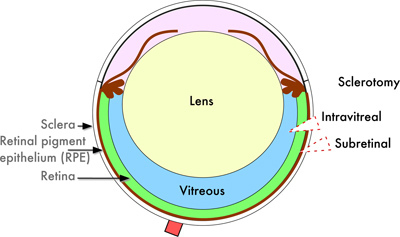 If clear (vitreous) fluid refluxes from the incision site, the blade was placed too deep and entered the vitreous cavity and the therapeutic virus or cells may enter the intravitreal space during injection. For visualization purposes, we have made the incision to this point in the video. It is still possible to complete a subretinal injection in this case, however the retinal detachment caused by the presence of the injection fluid may not fully heal in this mouse. Therefore, care must be taken to cut only the outer surface of the eye and not through the retina before injection. Carefully insert the injection needle into the incision site and advance it parallel to the outer eye wall to enter the subretinal space. Advancing too close to the outer wall or too deep within the eye will direct the injection into the wrong location. The best method to understand whether the needle is in the correct location is to practice the technique. Practicing on lightly pigmented or albino mice can help to make precise and accurate injections into the subretinal space. This is because the needle and injection fluid is visible within these eyes. Apply light pressure to the syringe plunger and begin injection of the desired fluid. If the needle is correctly placed within the subretinal space, moderate backpressure will be felt. If the needle is within the vitreous, there will be significantly less backpressure and potentially some fluid reflux during the injection. If there is significant backpressure, hold the needle in place for at least an additional 15 seconds before removing the needle slowly. This will allow the high intraocular pressure to equalize instead of refluxing the injected virus or cells back out the incision site. Some of the air and saline may be injected into the subretinal space due to the increased pressure required during the injection procedure. Care should be taken not to over-inject air or saline, since it can flush out the injected virus or cells from the eye. It is also possible to cause permanent retinal detachment from the presence of too much fluid injected into the subretinal space. For visualization purposes, excess dye and air was injected into the subretinal space in the video. It can be clearly seen how some of the dye will be flushed back out of the subretinal space if too much is injected, but also how the air bubble remains within the subretinal space and does not disappear into the vitreous. This was used to emphasize that these injections were all within the correct location of the eye, so one can visualize how the needle should enter the incision site. All injections into the subretinal space cause a temporary retinal detachment due to the presence of the injection fluid. If the injection procedure is completed correctly, this temporary retinal detachment will heal within 24 hr and mice can be used for all further experiments. The eye may remain soft for approximately one week due to the surgical procedure, so a second injection should be avoided during this period of time. For neonatal mice, use the curved dressing forceps to gently push the eye back behind the lids and into the orbit. It may be useful to wait for a minute in order to allow the virus to settle within the subretinal space and not cause it to be flushed out of the incision site when gently pushing the eye back into its orbit. After surgery, one drop of 0.5% bupivacaine (marcaine) diluted to 0.25% in sterile saline from a 25-gauge needle can be placed at the injection site. Mice do not show overt signs of distress after subretinal surgery and the use of bupivacaine as a long-acting topical analgesic has been ample for the previous three years. Mice should always be monitored after the surgical procedure to look for any signs of distress; such as infection, swelling, or a decrease in the usual daily activities of the mouse. If these occur, the veterinarian should be notified and further pain medications such as buprenorphine (0.05 mg/kg) can be given as an intraperitoneal injection. Wake the mouse from anesthesia according to locally approved animal handling protocol. The mouse should be kept on a heating pad to maintain normal body temperature as it wakes from the anesthetic. The surgical procedure should take less than five minutes to complete, not counting the time for the mouse to undergo anesthesia. Therefore, a heating pad is not necessary during the actual procedure, but may be needed while one is learning the technique as the procedure could take a longer duration of time. The mouse should not be placed back into a clean cage until it has begun to move around on its own. For neonates, gentle toe pinches will help for them to fully recover from the anesthesia, and they should regain their pink color and movement before being placed back with the mother. Mice should be monitored over time for any signs of distress as listed previously. A drawing of the mouse eye is shown with major structures labeled for reference, with arrows displaying the locations for both intravitreal and subretinal injection surgical procedures (arrowheads, Figure 1). Gene therapy vectors, such as the lacZ lentiviral vector (Figure 2), can be injected using these locations. Additionally, stem cells, such as mouse embryonic stem cells (Figure 3), can also be transplanted at these sites in the mouse eye. 1 μl of a lentiviral vector carrying the lacZ reporter gene driven by the cytomegalovirus (CMV) promoter (1x108 TU/ml, Lentigen Corporation, Figure 2A) was injected into the subretinal space of C57BL/6J mice. Eyes were enucleated at six weeks of age by blunt dissection and immersed in 1 mg/ml X-gal solution (5mM K3Fe(CN)6, 2 mM MgCl2, 0.02% NP40, and 0.1% sodium deoxycholate) overnight at 37 °C. Eyes were fixed in 2% formaldehyde/0.2% glutaraldehyde for 30 min and sectioned on a microtome. LacZ reporter gene expression was detected as X-gal product (blue) in approximately 10% of photoreceptor cells (Figure 2B). The intracellular presence of lacZ expression and the intact surrounding tissues indicate the successful subretinal injection in the mouse eye. C57BL/6J mouse embryonic stem (ES) cells were labeled with a green fluorescent protein (eGFP, Wellcome Trust Sanger Institute). These cells were then collected and suspended in sterile phosphate-buffered saline and transplanted into the subretinal space of post-natal day (P)5 C57BL/6J mice, with approximately 1x105 cells injected per 1 μl. Eyes were enucleated at two weeks of age by blunt dissection, fixed in a sucrose gradient and frozen in O.C.T. embedding medium (Tissue-Tek). Eyes were sectioned and visualized under fluorescence microscopy (Zeiss). The presence of GFP-labeled ES cells can be found within the subretinal space of the injected mouse eye (Figure 3A). Additionally, C57BL/6J-Tyrc-2j/J (C2J) mouse embryonic stem (ES) cells were electroporated with yellow fluorescent protein (YFP) and differentiated into retinal pigment epithelial (RPE) cells in vitro. After one month of differentiation, the YFP-labeled RPE-like C2J ES cells were suspended in sterile phosphate-buffered saline and injected into the subretinal space of P5 C57BL/6J mice. At 15 weeks of age, a mouse was visualized using live-imaging autofluorescence for the presence of YFP within the retina (Spectralis Scanning Laser Confocal Ophthalmoscope, Heidelberg Engineering, Figure 3B). Figure 1. Schematic of the Mouse Eye. A cartoon drawing depicting the structures of the mouse eye with sites for both intravitreal and subretinal injection procedures marked (arrowheads). Figure 2. Subretinal Injection of a Gene Therapy Viral Vector. A. Lentivirus vector map showing the lacZ reporter gene driven by the cytomegalovirus (CMV) promoter. B. Expression of the lacZ reporter gene in the retina in a six week old C57BL/6J mouse after subretinal injection at post-natal day five. 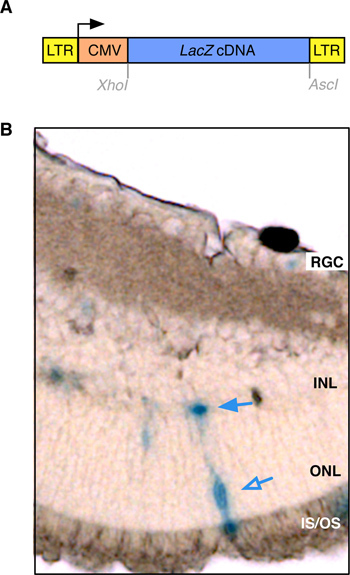 RGC, retinal ganglion cells; INL, inner nuclear layer; IS, photoreceptor inner segments (arrow); ONL, outer nuclear layer (photoreceptors)(arrowhead); OS, photoreceptor outer segments. Figure 3. Subretinal Injection of Mouse Embryonic Stem (ES) Cells. A. A two week old C57BL/6J mouse after subretinal injection of green fluorescent protein (GFP)-labeled ES cells at post-natal day five. GFP-positive cells are visible within the subretinal space of the injected eye using fluorescence microscopy (Zeiss). Green, GFP-labeled ES cells (arrows); RGL, retinal ganglion layer; INL, inner nuclear layer; ONL, outer nuclear layer (photoreceptors); IS/OS, inner and outer photoreceptor segments; RPE, retinal pigment epithelium. B. A 15 week old C57BL/6J mouse retina shown using autofluorescence live-imaging (Spectralis Scanning Laser Confocal Ophthalmoscope, Heidelberg Engineering) for the presence of yellow fluorescent protein (YFP)-labeled RPE-like C2J mouse ES cells within the retina. Subretinal injection of the RPE-like YFP-ES cells was performed at post-natal day five. The critical step in this procedure is entry into the subretinal space, since this ensures the correct location of gene therapy vectors or stem cell-derived tissues in order to have therapeutic efficacy, along with reducing the potential for retinal detachment or damage to the surrounding eye tissue. Care must be taken to troubleshoot ahead of time; to be able to locate and inject the fluid into the subretinal space. This can be done through practice using colored dye and albino mice, as shown in the video, since the injection needle will not be visible within the eye of pigmented mice. After practice, the researcher will learn to feel the difference in pressure when the fluid is correctly placed within the subretinal space and be comfortable with the surgical procedure to complete it in a timely manner. There are some potential modifications for this surgical procedure. These injections can be performed on mice of different ages, although the amount of gene therapy vectors or stem cell-derived tissues injected could vary depending on the age of the mouse. Care should be taken to determine how much fluid will promote treatment for the ophthalmic disease, but not prolong detachment and damage to the retina. The pulled capillary needle can be modified to have different diameters. Smaller needles are sufficient for viral injections, but larger diameters may be better for cellular transplantation. In addition, the surgery can be performed on adult mice. The eye tissue density will be much greater, so fresh, sharp surgical blades are required to penetrate into the subretinal space. In all cases, modifications can be made based on this protocol to complete a successful subretinal injection of a gene therapy vector or stem cell-derived tissue. All subretinal injections will cause a temporary retinal detachment due to the presence of the injected fluid within the subretinal space, but this detachment should heal within 24 hours of the surgical procedure. Mice can be carefully checked under a microscope for any remaining detachment. It is possible that some mice may not heal naturally even after a well-placed injection. All mice are able to undergo examination and experiments following this 24-hour time-period, however the eye may be soft due to a change in pressure from the injection procedure for up to one week. Therefore, one limitation of this technique is the ability to perform secondary injections during the first postoperative week. Another injection may not be possible during the immediate postoperative period, since the incidence of retinal detachment that does not heal after surgery is increased. It is advised to wait for a longer duration of time, as long as one month, before re-injecting the mouse eye. The mouse has become an important model organism to study ophthalmic disease and potential therapies that will lead to human clinical trials.9-12 A second limitation of this procedure is that not all cells are transfected with DNA vectors following subretinal injection, as they would be in a transgenic mouse model. However, this procedure may more closely approximate a clinical procedure in humans where not every cell is transfected. Thus, this technique can help to establish the feasibility for gene therapy viral vectors or stem cell-derived tissue transplantation therapy to treat age-related macular degeneration and other vitreoretinal diseases in humans. Future applications can include the use of different retinal cell promoters and differentiated stem cells, or even multiple injections using a combination of treatments. Research to Prevent Blindness; Experimental assistance from Takayuki Nagasaki; This research complies with the ARVO Statement for the Use of Animals in Ophthalmic and Visual Research. KJW is supported by NIH grants 5T32EY013933 and 5T32DK007647-20. VBM is supported by NIH grant K08EY020530. Prevalence of Blindness Data Tables [NEI Statistics and Data]. National Eye Insitute. Available from: http://www.nei.nih.gov/eyedata/pbd_tables.asp (2011). Abe, T. Regeneration of the retina using pigment epithelial cell transplantation. Nihon Ganka Gakkai Zasshi. 106, 778-803 (2002). Jacobson, S. G., Cideciyan, A. V., Ratnakaram, R., Heon, E., Schwartz, S. B., Roman, A. J., Peden, M. C., Aleman, T. S., Boye, S. L., Sumaroka, A., et al. Gene therapy for Leber congenital amaurosis caused by RPE65 mutations: safety and efficacy in 15 children and adults followed up to 3 years. Arch. Ophthalmol. 130, 9-24 (2011). Schwartz, S. D., Hubschman, J. P., Heilwell, G., Franco-Cardenas, V., Pan, C. K., Ostrick, R. M., Mickunas, E., Gay, R., Klimanskaya, I., Lanza, R. Embryonic stem cell trials for macular degeneration: a preliminary report. Lancet. 379, 713-720 (2012). 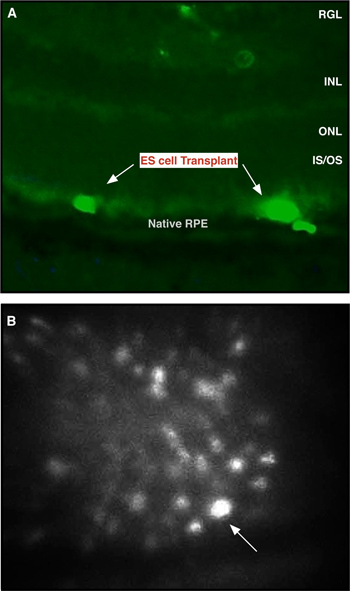 Wang, N. K., Tosi, J., Kasanuki, J. M., Chou, C. L., Kong, J., Parmalee, N., Wert, K. J., Allikmets, R. Transplantation of reprogrammed embryonic stem cells improves visual function in a mouse model for retinitis pigmentosa. Transplantation. 89, 911-919 (2010). Song, B. J., Tsang, S. H., Lin, C. -S. Genetic models of retinal degeneration and targets for gene therapy. Gene Ther. Mol. Biol. 11, 229-262 (2007). Tosi, J., Sancho-Pelluz, J., Davis, R. J., Hsu, C. W., Wolpert, K. V., Sengillo, J. D., Lin, C. S., Tsang, S. H. Lentivirus-mediated expression of cDNA and shRNA slows degeneration in retinitis pigmentosa. Exp. Biol. Med. 236, 1211-1217 (2011). Tucker, B. A., Park, I. H., Qi, S. D., Klassen, H. J., Jiang, C., Yao, J., Redenti, S., Daley, G. Q., Young, M. J. Transplantation of adult mouse iPS cell-derived photoreceptor precursors restores retinal structure and function in degenerative mice. PLoS One. 6, e189992 (2011). Mahajan, V. B., Mondino, B. J., Tsang, S. H. A high-throughput Mouse Eye Phenomics System. Cold Spring Harbor Laboratories. (2010). Chang, B., Hawes, N. L., Hurd, R. E., Davisson, M. T., Nusinowitz, S., Heckenlively, J. R. Retinal degeneration mutants in the mouse. Vision Res. 42, 517-525 (2002). Hawes, N. L., Smith, R. S., Chang, B., Davisson, M., Heckenlively, J. R., John, S. W. Mouse fundus photography and angiography: a catalogue of normal and mutant phenotypes. Mol. Vis. 5, 22 (1999). Won, J., Shi, L. Y., Hicks, W., Wang, J., Hurd, R., Naggert, J. K., Chang, B., Nishina, P. M. Mouse model resources for vision research. J. Ophthalmol. 2011, 391384 (2011). girlfriend has RP and her condition is worsening.